The best custom swim caps designer for your schools, club, triathlon or swim team. You can customize your caps with your logo, design, swimmer's name, available with a complimentary custom design service. Now with new ink marking process that resist chlorine, UV rays and elasticity, the swim cap has become more original and fanciful. For a swim cap marked with the colors and design of your choice, why not opt for a personalized swim cap? 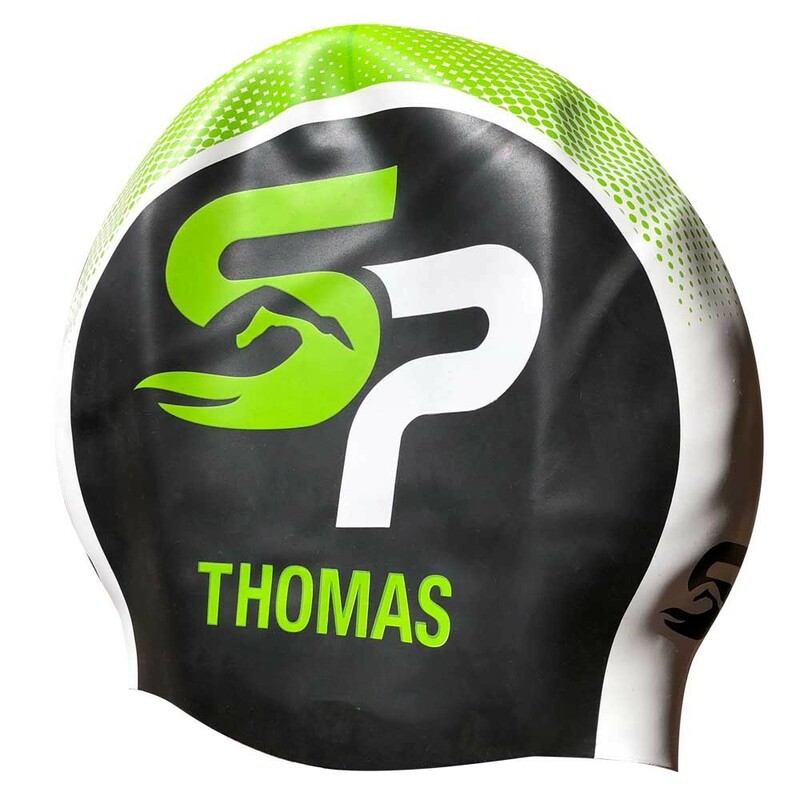 You want to print a swimming cap with a logo, a picture, a text, a number or an exclusive name for your club, school, triathlon, event, advertising action ... at a very competitive price. CONTACT US by email at info@making-a-splash.com . Why customize your swim cap ? Printed swimming caps are perfect to promote a swim team, a school , a race or event such as a triathlon. Custom swim caps are designed to unify a team's look both in practice and at meets. Quality swim caps are important for performance, but they are also important for team spirit and morale. With custom caps your swimmers will feel and look like a team! “Swim caps can only be customized using a special screen print method due to the type of material they are made of. Screen printing is when pigment is pushed through a screen onto the material itself. We do not recommend screen printing logos that have shading and gradients, since each different shade of color counts as a separate color, with an additional cost. For a good result, it is important to start with a logo of good quality (that you can send us in JPG, PDF, AI). We can help you with your artwork and design needs for your swim caps. Our swim cap artwork and design services are FREE . Just send us your design or tell us what you want and our full time swim cap art department will create the perfect custom swim caps for your swim team .We will then offer some examples on which you can make any desired changes. Finally, we submit the Final ARTWORK that you will confirm and that will be used to mark the bathing cap. Screen printing is a method of marking in several steps and requires a period of 3 weeks of manufacture. To receive your price offer and the FREE digital mock-ups of your project.